The Puddle Jumper is a con-caved, planing surface speeder. Domestic bliss with a twist. Based off the outline of the Bottom Feeder, but with reversed bottom and rocker curves. 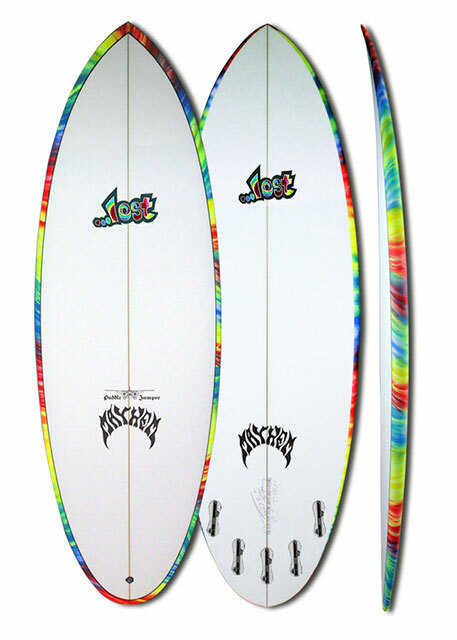 This board, unlike the past Domestic models (like The Bottom Feeder and RV) features a concave bottom that transitions to vee in the tail. The wide outline makes for easy wave catching and down the line glide and stability. The concave bottom adds lift and increased rail curve, which allows radical top to bottom surfing. The straight rail line and vee in the tail keep the board moving forward and hold in during hard carving maneuvers.